Diamonds by Raymond Lee is a family owned business in sunny South Florida. With both online and in store professional service, finding the perfect diamond is easier then ever. Our highly trained diamond advisers will happily assist you when it comes to your next jewelry purchase. Below is our FAQ for Diamonds by Raymond Lee. Does this setting include the center diamond? In general, most designer engagement ring settings do not come with a center diamond. The center stone you see pictured is a cubic zirconia (CZ) and is a placeholder to help shoppers visualize the setting with a diamond center. If you do not wish to set a diamond in the setting at this time, the ring will come with the CZ as shown in the picture. Our settings are priced by our Manufacturer Suggested Retail Price, and vary depending on the style, shape and size. Center stones are purchased separately and entail a different set of guidelines. A complimentary cubic zirconia can be set if desired. Can you make this in a different metal? Metal choices will vary depending on the designer. All brands have rings available to be made in 18k gold and platinum. Some of our lines offer 14k as a metal choice as well. 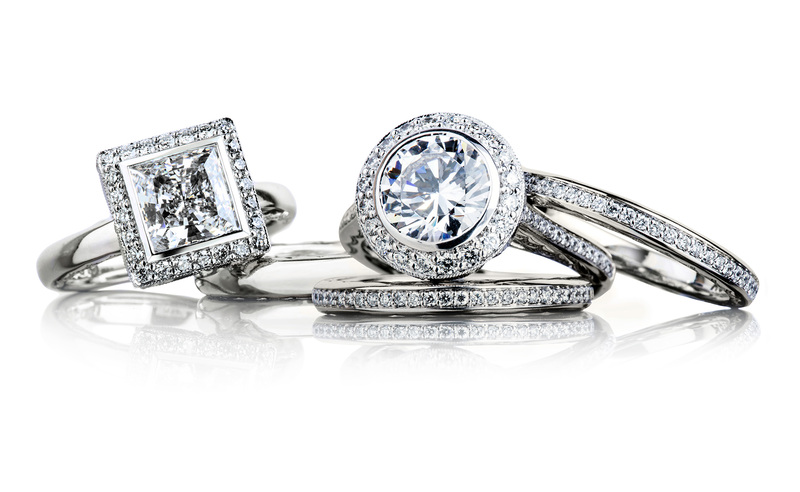 In most cases, a ring can be customized to your preference of yellow, rose, or white gold. If you do not see your desired metal choice available, please contact us and we’d be happy to check on availability. Can you make this with a __ carat diamond? Every ring is customizable, including the center diamond. At Diamonds by Raymond Lee we understand that for every unique diamond, there is an equally unique woman. With Master Jewelers on site, each and every ring we carry can be customized to fit your desired stone shape and size. We can even create your dream ring from scratch. Contact our team of diamond advisers for more information on ring customization. Do you provide appraisals for insurance purposes? Yes! Diamonds by Raymond Lee’s lifetime warranty includes complimentary insurance appraisals on your items purchased for life. The value of diamonds can fluctuate greatly and we encourage all of our customers to take advantage of this valued service. What if I don’t know her finger size? Our diamond advisers are here to make your experience enjoyable and stress-free. Not only will our specialists help determine the correct ring size for your significant other, but if for any reason in the future you need it to be re-sized, we’ll do it for free! Complimentary re-sizing in-house is a part of our lifetime warranty that comes with all purchases. In some cases, rings are not easily sizable and must be returned to the manufacturer for altering. In this case, there may be a fee associated with sizing. How much is a 1 carat diamond? Each individual diamond varies, as does the price. There is no absolute price for a set diamond weight. Diamond prices depend on the cut, color, clarity, grade, fluorescence, certifications, and other factors. With today’s market at an all time high, demand for diamonds with excellent cut, color and clarity are rare to come by thus the higher cost. Contact our diamond advisers for more information on diamond prices. We will be sure to find you a quality stone within your budget. You may also search our online diamond database to get an idea of diamond prices with varying characteristics. If you’re looking for a specific stone and do not see it on our list, please contact our diamond concierge and we will happily locate a stone to meet your specifications. Are you an authorized retailer for ___? Diamonds by Raymond Lee is an authorized retailer for every brand we offer both online and in-store. We are proud to be an authorized retailer for the following designers: Tacori, Verragio, Henri Daussi, Gabriel & Co., Simon G., A.Jaffe. Benchmark, Crown Ring, and Lashbrook. Please visit our Authorized Retailers section for additional information. Why is your diamond more expensive than this price I found online? Diamonds are graded with certificates determined by individual diamond graders. No two diamonds are exactly alike. We believe that diamonds should not be priced based on certificates alone, which do not always reflect the way a diamond looks in person. At Diamonds by Raymond Lee we look at each individual diamond and price it according to its unique characteristics. Does this ring come with a warranty? In order to maintain the quality and longevity of your jewelry, all purchases come with a lifetime warranty. This lifetime warranty includes: receiving free rhodium with polishing, complimentary cleaning and prong checking on all settings, coverage on loss and manufacturing defects on all of our settings*, complimentary ring re-sizing*, complimentary insurance appraisals, and 100% credit towards any future upgrades on your diamond, guaranteed. *Please visit our Lifetime Warranty section for additional information. Diamonds by Raymond Lee offers a a full money back guarantee on all in stock purchases. Items must arrive within 30 days of initial purchase in original, unaltered, unworn condition along with any original certificates and documentation. Please note, special orders cannot be returned for a refund but may be exchanged. Please refer to our shipping & returns page for additional information. Contact us at (561) 623-8205 prior to sending your item back. Diamonds by Raymond Lee offers both financing and layaway payment plans. We offer 0% financing for in-store financing and you must come in person to apply. For online payment plans, we offer 6 month interest-free financing via Paypal as well as 1 year financing with Affirm. Please visit our Financing page for more info.